On Friday, December 15th, the Federal Government proposed in the Canada Gazette the creation of an Open Work Permit Program for Workers Facing Abuse or Risk of Abuse. This Open Permit is in line with our proposed permits and are a step in the right direction. Click here to see our original submissions calling for this permit in December 2017. 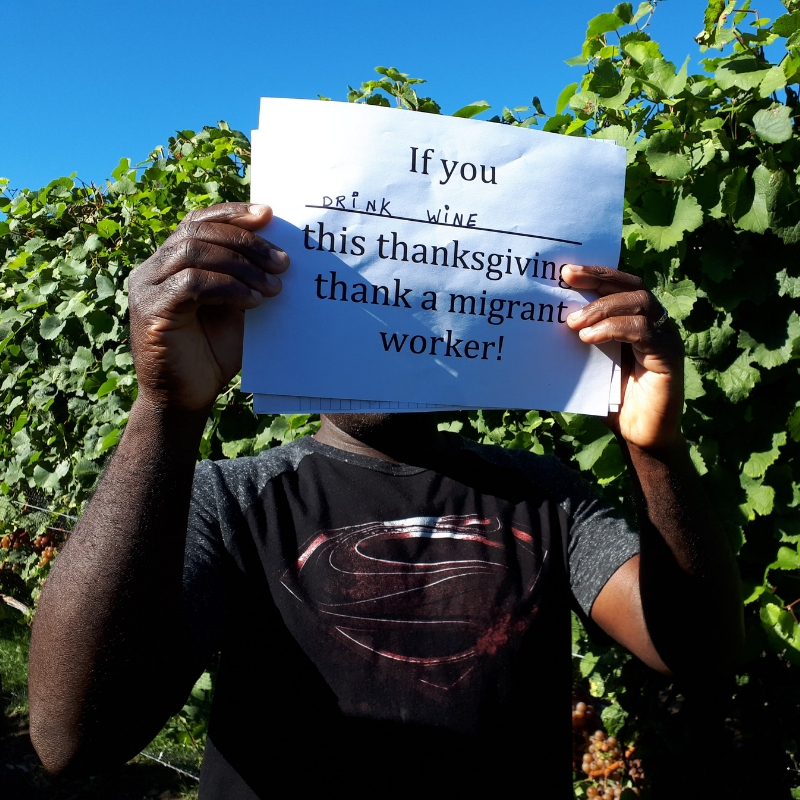 The Migrant Workers Alliance for Change has made specific submissions on ways to ensure that the proposed Open Work Permits actually ensure migrant worker protections – Read them here. Lack of specific investigative mechanisms to ensure workers are compensated for harms. Take Action Now! Send a letter to the Federal Government right now calling for changes. Use this template letter to draft your own submissions. Please share this with your colleagues. As you sit down with your family and friends for a Thanksgiving meal this weekend, take a moment to think about who grew your food, who caught the turkey, who picked the grapes. 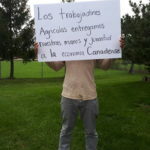 The migrant farmworkers who did have a message for you. They too want to be with their families. And they are asking you to help spread their story on Facebook and Twitter. 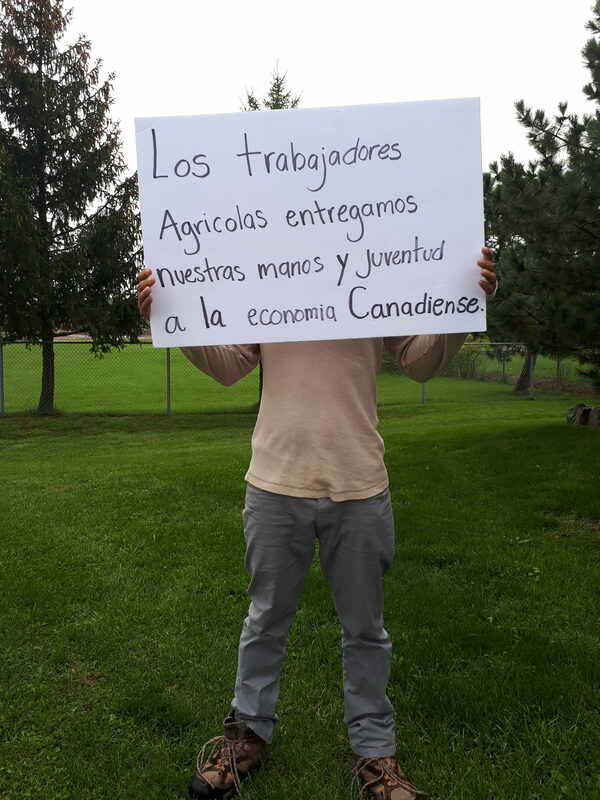 Featured in these photos are three of the over 40,000 migrant agricultural workers that come to Canada year after year, working in fields, greenhouses and factories. These jobs are dangerous, low-waged and necessary. Without them, our food system would simply not work. Yet, the law excludes them from basic protections, or the ability to reunite with their families. While they are afraid of reprisals from bosses if they show their faces, they are organizing and resisting. This Thanksgiving, they are asking people across Canada to remember them. 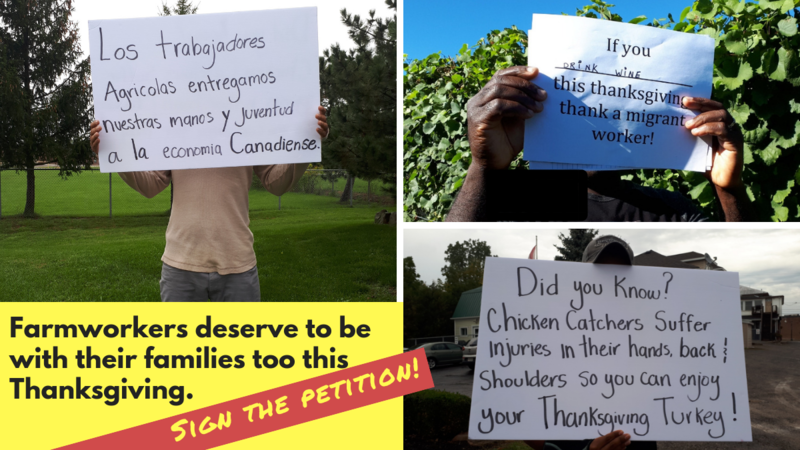 Share their story on Facebook and Twitter this weekend and urge your friends and family to sign this petition: http://migrantrights.ca/en/take-action/#email. Read their stories below. Their names have been changed to protect workers against employer reprisals. A century of experience has demonstrated that caregiving labour is an ongoing permanent need in the economy. More than 60 years of caregivers’ experience with temporary labour migration to Canada has demonstrated consistent, well-documented, widespread problems of exploitation and abuse by employers and recruiters. 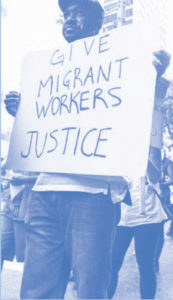 Repeated reviews by Parliamentary Committees (most recently the 2016 HUMA Committee hearings), as well as academic and community-based research have demonstrated that this exploitation is rooted in the vulnerability that is created by the terms of Canada’s temporary labour migration program itself. In addition, caregivers over the past four decades of the program have suffered from the ‘two-step’ immigration system that requires them to finish their employment contracts before being allowed to apply for permanent residency. This has led to profoundly damaging and lasting impacts on the physical and mental health of caregivers and their families. Years of family separation can cause intergenerational conflicts between caregivers and their children as well as family breakdown. A comprehensive and transparent consultation process to reform the Caregiver Program. A new Federal Workers Program – Caregiver Stream that provides caregivers with permanent status on entry and family unity. Reforms to protect caregivers who are already in Canada and in the backlog to ensure that no one is left behind. 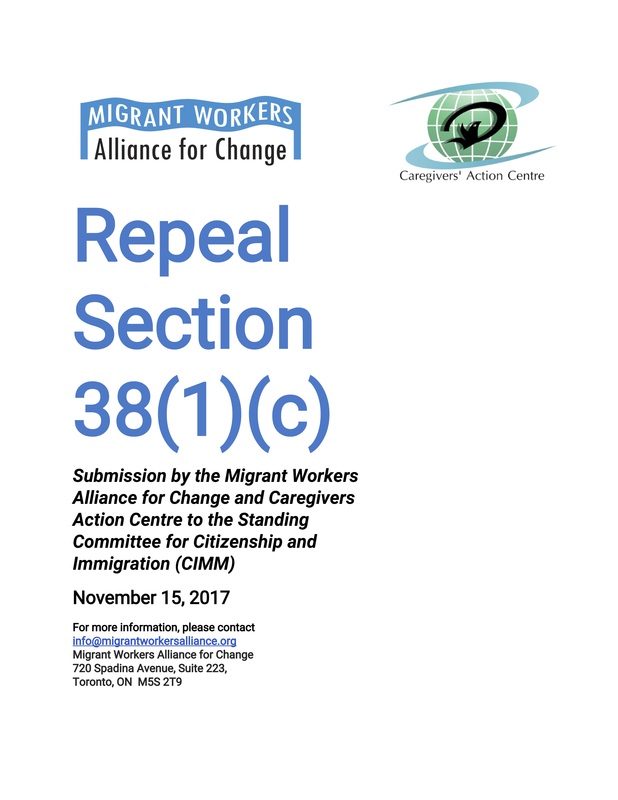 These interim reforms will involve allowing caregivers to come to Canada with their families; eliminating the backlog in caregivers’ permanent residency applications; removing the ‘excessive demand’ provision in the Immigration and Refugee Protection Act (IRPA); regularizing the status of caregivers who have become undocumented; developing immigration criteria that are consistent with what is needed to do the job; and putting an end to the second medical and to excessive educational and language requirements re-introduced in 2014. We particularly urge the creation of an open work permit program as an interim measure. What’s happening with the Caregiver Program? Download this flyer, and share with other Caregivers. The current “Pathways” Caregiver Program was created in November 2014 for five years. It is is set to expire on November 29, 2019. Unless the program changes – no applications for permanent residency will be received after November 29, 2019. This is a crisis AND and an opportunity. The government has promised to review the Caregiver program and make changes before November 29, 2019. 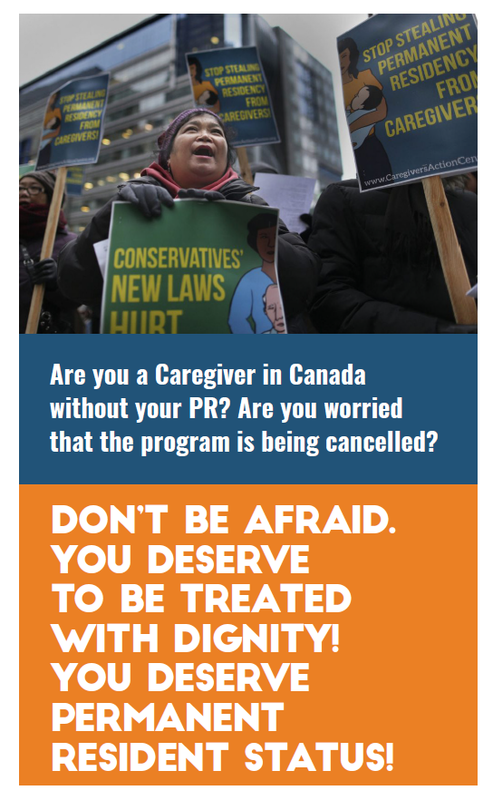 If we do nothing – then the Caregiver program could disappear. But if we work together – we may be able to create a better program. Caregivers: Don’t be afraid. You deserve to be treated with dignity! You deserve permanent resident status! Right now we need to bring together issues of low-wages, employer abuse, tied work permits, permanent residency backlog and family reunification. We want a new program with permanent status for all migrant workers. We need to tell the government that we want a new program that gives us permanent status, the ability to move between jobs, and to be reunited with our families. Caregiving is real work, it’s useful, it’s important and Caregivers deserve real worker rights. Educate yourself on what the government is planning, and get in touch with your local Caregiver organizations to talk about what a new Caregiver program should look like. In this phase of Ontario’s exemption review, only eight occupations are being considered: architects, homemakers, domestic workers, residential care workers, IT professionals, managers and supervisors, pharmacists, and superintendents. 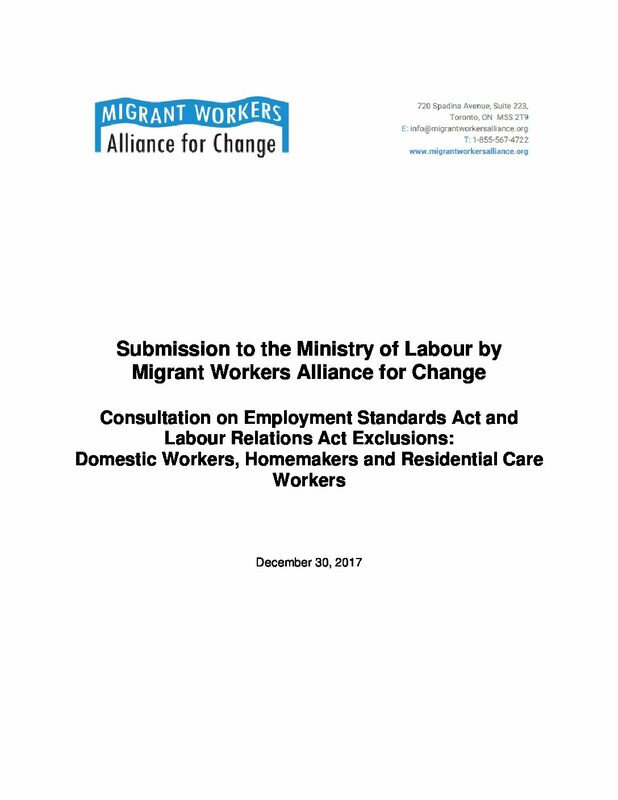 Migrant Workers Alliance for Change endorses the submissions made by the Workers’ Action Centre and Parkdale Community Legal Services. These submissions will focus on Domestic Workers, Homemakers and Residential Care Workers, as these sectors impact most upon migrant worker labour. Domestic Workers do the critical work of caring for children, persons with disabilities and older persons. The caregiving sector is reliant on the work of migrant workers, primarily women, who risk their jobs and their hopes of permanent residence in Canada if they complain about violations of their rights. This workforce is overwhelmingly female, racialized, poorly paid and highly precarious. Domestic workers include people with and without regularized immigration status and migrant workers employed through the Temporary Foreign Worker Program. The caregiving sector is rife with abuses ranging from unpaid overtime to sexual abuse and racial discrimination. Often working alone in their employer’s home, caregivers need robust employment standards protections, support for collective action to improve their conditions of work, and effective rights enforcement. Ontario’s employment and labour law regimes currently accomplish none of these things. Domestic Workers are subject to a special minimum wage rule that allows employers to deduct room and board from wages for the purposes of determining whether minimum wage has been paid. This special minimum wage rule is inconsistent with the federal Caregiver Program policies that prohibit employers from charging room and board to live-in caregivers. When it comes to protections for unionization, Domestic Workers working in private homes are explicitly excluded from the Labour Relations Act and collective bargaining units made up of one person are not permitted. Caregiver work is in practice very fluid, with movement between residential care homes and live-in caregiving situations. Some are recruited into other types of care work when they experience problems in the federal Caregiver Program, for example when they fall out of status for leaving an abusive workplace and must find a way to support themselves and their families. Because of this fluidity, migrant caregivers are also impacted by two other sectors under review: homemakers and residential care workers. Caregivers who are considered “homemakers” are exempt from a litany of employment standards including daily and weekly hours of work limits, overtime, daily rest periods, eating periods and time off between shifts or work weeks. They are entitled to wages to a maximum of 12 hours per day of pay, even when they work more. A residential care worker, who cares for children or disabled persons in family-type residential dwellings, does not enjoy minimum protections for hours of work and eating periods (daily and weekly limits on hours of work, mandatory rest periods and eating periods), overtime, and the right to payment for hours worked after 12 hours per day. None of these exemptions can be justified and we urge Ontario to eliminate them. 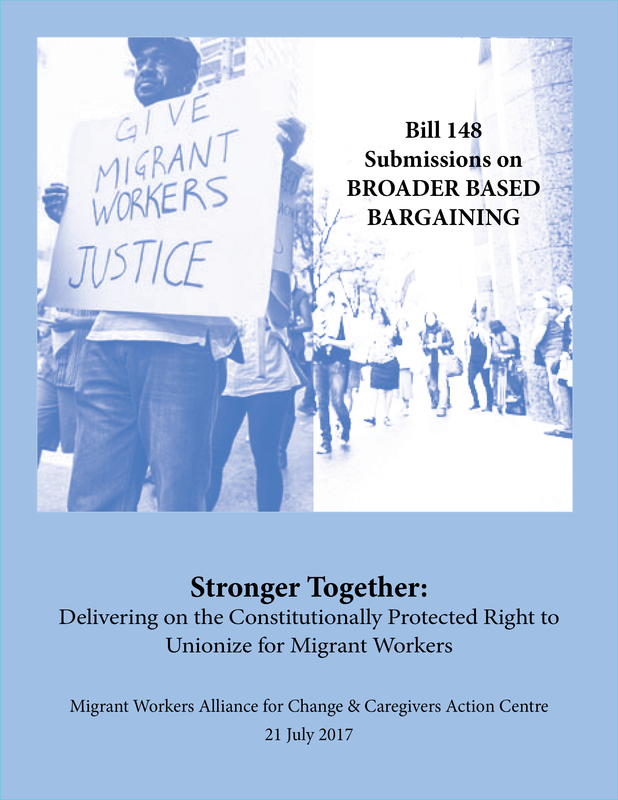 Instead, Ontario must take the necessary steps to ensure that caregiving work is free of exploitation and abuse, including by implementing the kinds of “broader based bargaining” strategies that would make collective action and worker power a reality for caregivers. 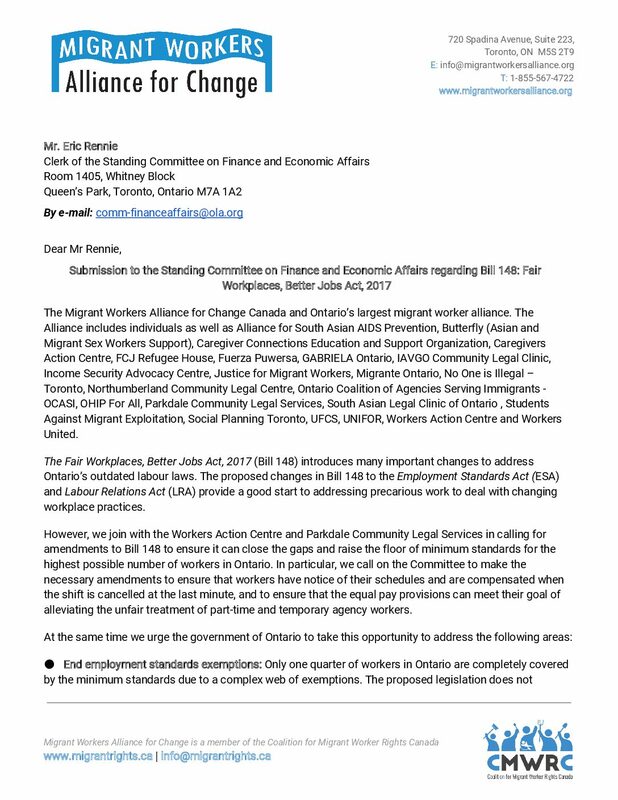 In the next phases of this exemption review, Ontario must prioritize those industries where workers are most vulnerable, including sectors that rely heavily on migrant labour. In particular, we urge Ontario to ensure that the agricultural sector is included in the next phase of the review. 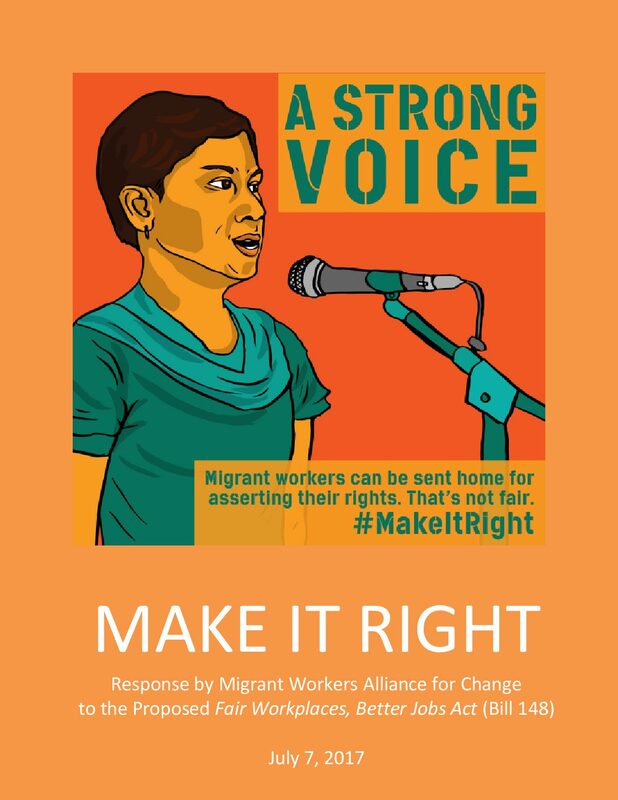 Migrant workers and their support organizations across Canada call on the Federal Government to ensure permanent resident status upon arrival for all migrant workers. 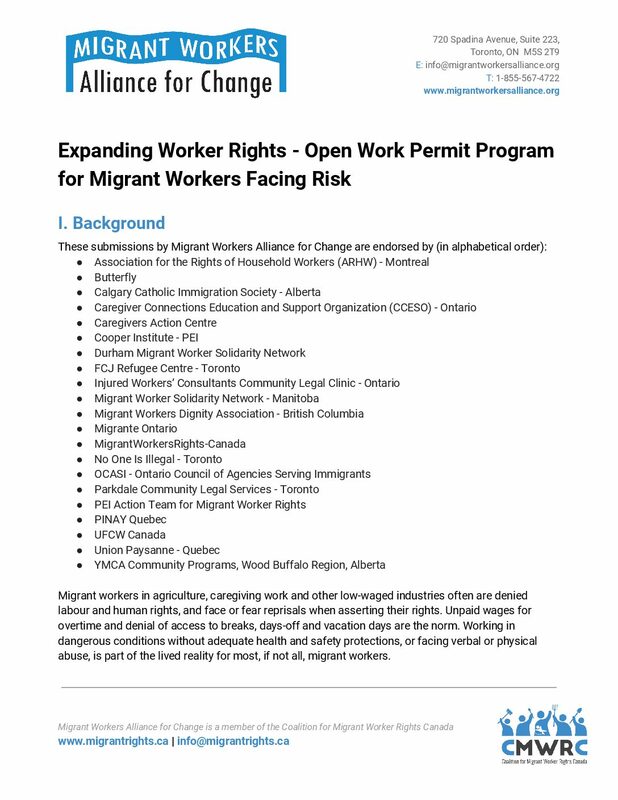 The current system of temporary, employer specific work permits leaves labour and human rights beyond the reach of migrant workers in Canada. As an interim step to permanent resident status, we are calling on the Federal Government to create open work permits for all workers. The Federal Government, however, has begun discussions about creating an open work permit program for workers facing abuse only. Here are submissions on how to make this program effective and responsive.